When Tommy Wingels was growing up, hockey always came second. In the Wingels household, school was the first priority. Even if making it to the National Hockey League became an option, there was no wiggle room when it came to earning a college degree. So when Wingels went to play for the American Hockey League’s Worcester Sharks following his junior season at Miami University of Ohio, there was no doubt in his mind he’d find a way to finish his education. So he signed up for summer school and committed to his upper division requirements. The 23-year-old is currently enrolled in his final class and will receive his bachelor’s in Accounting on Aug. 3. This is the type of story that you so rarely get to read. An athlete gets drafted, leaves college early, but is committed to finishing his education. If you’re looking for a role model for your kids – look no further than Wingels. “It’s just the way I was raised,” Wingels said. “School was always very important. From the time I was a little kid, my parents stressed the importance of not just being book smart, but street smart. I’m sure Wingels would make a fantastic accountant. But he’s too good on skates to be walking around in a suit. After he was drafted by the Sharks in 2008 (sixth round, 177th overall), he played three years at Miami. While serving as captain in his junior year, he set career highs in goals (17), assists (25) and points (42) as he led the RedHawks to their second consecutive Frozen Four appearance. After that, he was on his way to AHL. And summer school. 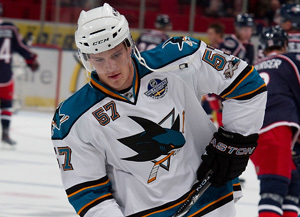 During the 2010-11 season, Wingels spent time in both Worcester and San Jose. Following an impressive training camp, he earned the right to join the Sharks at the NHL Premiere in Stockholm, Sweden. The native of Evanston, Ill. played his first NHL game on Oct 8 – a 3-2 win over the Columbus Blue Jackets in which he had 4:55 of ice time. After the Premiere, he was assigned to Worcester and spent the majority of the season playing in the AHL. In 69 games, the 6-foot, 195-pound center scored 33 points (17 goals and 16 assists) and was named Worcester’s Rookie of the Year. He did, however, get four more opportunities to play with the big club. Wingels was recalled for a game against Edmonton on Nov 27 and played with San Jose for three games between Dec 29 and Jan 1. While in Silicon Valley, Wingels played alongside fellow Miami alum Dan Boyle. The experience made an impression on Wingels. Although he was undrafted out of Miami, Boyle is one of Miami’s greatest success stories. The 5-foot-11 defenseman won a Stanley Cup with Tampa Bay in 2004 and a gold medal for Team Canada at the 2010 Winter Olympics. With the Sharks, Boyle has registered three consecutive seasons with 50 or more points and in 2011 he was selected to the NHL All-Star Team. Wingels has followed Boyle in many regards. 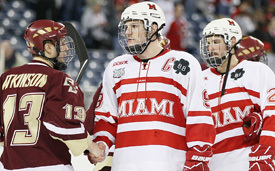 Both players enjoyed success at Miami, both players transitioned from college to the AHL and both players are now members of the Sharks organization. And after Aug. 3, Wingels and Boyle will have another thing in common. Both will have earned their college degrees. Boyle graduated in 1998 with a bachelor’s in Sports Studies and once Wingels’ summer school class is completed – he’ll be a member of Miami University’s Class of 2011. But don’t expect either to pursue their field of study anytime soon. Right now, hockey is the top priority.